Many of us take antibiotics for granted, but rising bacterial resistance is having major health consequences. The World Health Organization has declared resistance to antibiotics to be one of the greatest threats to human health. This strong statement raises several questions. What is antibiotic resistance, and why is it a threat to health? 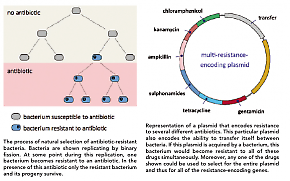 Why does antibiotic resistance occur? Before considering these issues we need to know what antibiotics are. Strictly speaking, antibiotics are naturally occurring chemical substances produced by microorganisms (most often fungi) that exert harmful effects on other organisms. The first antibiotic used to treat infections in humans was penicillin G, which was originally derived from a Penicillium mould. Today many antibiotics are manufactured synthetically, so the strict definition no longer applies. Nevertheless, all of the antimicrobial drugs used to treat infection work on the principle that they harm infectious agents while causing minimal damage to the host. This mostly works, because the antibiotics target a structure or biochemical pathway that is present in bacteria but missing from animal cells. Although some antibiotics are active against fungi, their major use is to treat infections caused by bacteria. What Is Antibiotic Resistance and Why Is It a Threat to Health? Over time, many leading causes of infections of humans, including bacteria such as Staphylococcus aureus (golden staph), Escherichia coli and Mycobacterium tuberculosis, have become resistant to a wide variety of different antibiotics. This means that infections caused by these bacteria, often called “superbugs”, do not respond to treatment in the way they once did. The seriousness of this situation is compounded by the fact that we are starting to run out of antibiotics we can rely on to treat serious infections, and it is becoming increasingly common for doctors to see patients with life-threatening bacterial infections for which there are no useful antibiotics left. This is like going back in time more than 70 years to the period before antibiotics were discovered. The main reason for antibiotic resistance is the considerable evolutionary advantage bacteria have over humans and other mammals. The principal features of bacteria in this regard are their enormous numbers, their capacity to replicate extremely quickly, and their ability to modify their genetic makeup and to acquire new genes. The Human Microbiome Project (http://www.genome.gov/27549144) has revealed that each human being is home to about 1014 bacteria, approximately 70% of which reside in our intestines. These bacteria, known collectively as our normal microbiota, seldom cause us harm. In fact, many benefit us by promoting healthy development of the immune system. Put another way, there are more bacterial cells in a teaspoon of intestinal contents than people who have ever lived. Also, although our bodies are the product of around 25,000 genes, we also carry within us more than one million unique bacterial genes. The second reason why bacteria have an advantage over us is that a generation for an average bacterium is around 20–30 minutes, while for humans it is more like 20–30 years. In other words, bacteria replicate more than 500,000 times faster than ourselves. This means they can adapt and respond to or recover from a threat to their survival far more rapidly than we can. Also, because bacteria replicate by binary fission (one cell becomes two, two become four, four become eight, and so on) their numbers increase very quickly. For example, if we start with just one bacterium, after 12 hours (approximately 36 generations) we would have 236 or around 70 billion bacteria, which is ten times the number of people alive today. The ability of bacteria to replicate quickly also means they have extraordinary recovery powers from events that in humans would be unimaginably catastrophic. Consider a situation where a population of one billion bacteria are exposed to a chemical that kills all but one of them because it is resistant to that chemical. Amazingly, an entirely new population of one billion resistant bacteria can emerge from that single cell within a few hours. The third advantage bacteria have over us is their genetic malleability. Just like us, bacteria tend to breed true (i.e. their offspring carry the same genes as their parent), but if they are under stress the rate of random mutation in the DNA of their single chromosome can increase, making favourable (and unfavourable) mutations more likely. A beneficial mutation could take a long time to occur, even several years. But if it gives the mutant a survival advantage, this mutant will persist and may start to dominate the population of that particular bacterial species as a whole. In addition, bacteria can acquire genes directly from other bacteria, including bacteria that are quite unrelated to them. One particularly insidious means of gene transfer between bacteria involves plasmids. These are small closed circles of double-stranded DNA that “infect” bacteria, and then replicate independently using the host bacterium’s replication machinery. Plasmids have probably been around for almost as long as bacteria – 3.5–4 billion years. During the past 70 years, however, since the beginning of the widespread use of antibiotics, many different plasmids have acquired genes that encode resistance to specific antibiotics. An example is a gene that encodes penicillinase, an enzyme that breaks down penicillin, rendering it completely useless. Today there are many examples of plasmids that encode resistance to several different types of antibiotic, such as penicillins, tetracyclines, erythromycin and many other clinically valuable drugs. A bacterium that acquires one of these plasmids will, in one genetic event, become resistant to all of these drugs at the same time. By their very nature, antibiotics are extremely powerful agents of natural selection (survival of the fittest). This is because all of the antibacterial drugs in current use act by killing bacteria or markedly slowing their growth. Bacteria that are resistant to a particular drug will have an enormous evolutionary advantage in the presence of this drug and soon become the dominant population. Furthermore, if the resistance is encoded by a gene on a plasmid, all of the other resistance-encoding genes on this plasmid will also be selected because they are genetically linked to each other. An important source of genes that encode resistance to antibiotics is the normal microbiota that live in our bodies and those of our domestic animals. Although these bacteria are mostly harmless or even beneficial, they and their ancestors have survived countless exposures to antibiotics that we and other people, as well as our companion and food animals, have consumed during the past 70 years. When antibiotic resistance first emerged as a clinical problem, the response of pharmaceutical companies was to develop new drugs to replace those that were no longer useful. However, as you will appreciate from the nature and origin of resistance, these new drugs also soon became ineffective. The extremely high cost of developing new drugs no longer warrants this investment by most pharmaceutical companies. For this reason governments in Europe and North America are offering strong financial incentives for companies to develop new drugs, but the uptake has been slow. Some researchers are investigating entirely new types of antibacterial agents. These drugs do not interfere with growth, but instead target the ability of pathogenic bacteria to cause disease. These drugs would have no effect on the normal microbiota because they act on specific targets that are present only in disease-causing bacteria. Such drugs are at an early stage of development and have not yet been trialled in humans. In the meantime, all we can do is to use antibiotics more responsibly than we have in the past. One of the reasons that resistance has emerged so rapidly and spread so widely has been the irresponsible use of the antibiotics we have. This includes adding them to animal feeds to encourage growth and using them in circumstances where they are known not to work, such as for colds and other infections caused by viruses. So, when you next visit your local doctor with a cold and he or she tells you that you don’t need an antibiotic, you should not try to force their hand but respect their advice and welcome the fact that they are playing an important role by preserving the usefulness of these remarkably beneficial drugs for as long as possible.